Arising from its summit in Lagos on Monday, the Southern Governors’ Forum, SGF, has called for devolution of power that will entrench true federalism as well as restate commitment to the unity and indivisibility of Nigeria. 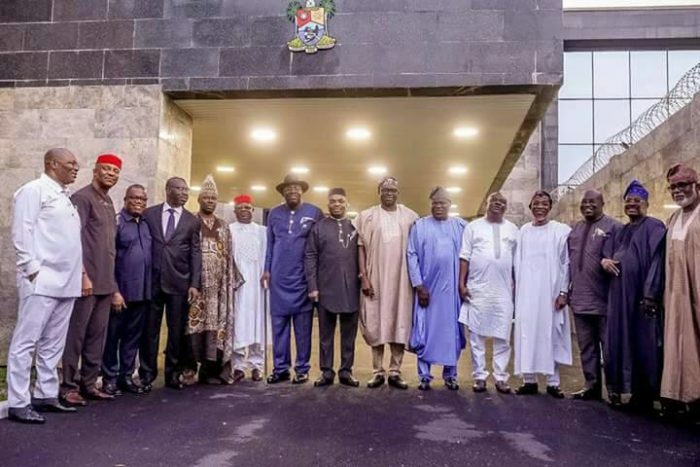 The Governors present include the Six Southwest Govs: Lagos State Governor, Mr. Akinwunmi Ambode; Ekiti State Governor, Mr. Ayo Fayose; Ogun State Governor, Sen. Ibikunle Amosun; Ondo State Governor, Mr. Rotimi Akeredolu; Osun State Governor, Ogbeni Rauf Aregbesola and Oyo State Governor, Sen. Abiola Ajimobi. Also present are the Governor’s of Rivers State, Nyesom Wike; Edo State, Mr. Godwin Obaseki; Abia State, Okezie Ikpeazu; Enugu State, Ifeanyi Ugwuanyi; Akwa Ibom State, Mr. Emmanuel Udom and Ebonyi State, David Umahi. The Deputy Governors of Anambra, Dr Nkem Okeke and Cross River State, Professor Ivara Esu are also present at the event. Reading the communique at the end of the meeting, Governor Akinwunmi Ambode said the Southern Governor’s Forum restated its commitment to a united, indivisible Nigeria. He said the summit also reiterated its position on true federalism and devolution of powers and also restated its commitment to collaborate in the region for the growth and development of their economies. Ambode added that the summit restated commitment to security of lives and properties of the citizens as well as emphasized the need for effective linkage of good infrastructure within the sphere of southern Nigeria. Earlier in his opening speech at the summit, Ambode said previous Forum held in the past achieved much, but noted that there “is still a lot to be done. There is certainly a lot to be done about true federalism, an issue that requires urgent, meticulous and proactive attention from the Forum. He said that the productivity and revenue-generating capacities of most of the states were stifled thus turning them into no better than street beggar states incapable of even meeting routine obligations of paying workers’ salaries and pensions without federal support. Ambode stated that the resuscitation of the Southern Governors Forum was coming at a most appropriate time. “As we are aware, the Senate and House of Representatives are currently harmonizing their differences on the proposed amendments of the 1999 Constitution before they are transmitted to the State House of Assemblies for approval. It is important for this Forum to comprehensively look at the proposed amendments with a view to working with our respective House of Assemblies to ensure a coordinated response on our part that will strengthen the practice of democracy, federalism, constitutionalism and the rule of law,” he said. At the meeting, Governor Ambode was unanimously appointed as the Chairman of the Southern Governors Forum (SGF) while Governors Seriake Dickson of Bayelsa and David Umahi of Ebonyi States were appointed as Co- Chairmen of the Forum.